Written by Rob Innes- Strength & Conditioning Coach at The Academy. If you’re serious about playing AFL footy, you’ll know that you need to be fit and healthy to help your body – and mind – cope with the challenges of playing this fast-paced, strenuous game. 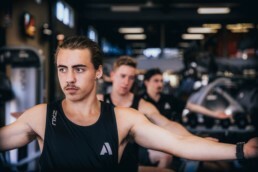 Getting yourself in the peak condition that senior AFL football requires takes commitment, dedication and 3 important steps on your fitness journey. At The Academy, our approach to help young players build a strong foundation for their future sporting ambitions is to focus on some core fitness basics that help prepare your body and your mindset for the tough nature of this great game. Cardiovascular fitness is important in football due to the unique nature of Australian Rules Football, as it places both endurance and dynamic demands on the body. The good news is that, if you’re keen to improve your game performance, cardiovascular fitness can be enhanced by a number of fitness tasks. The most specific, of course, is running. Australian Rules Football is a game that’s made up of running long distances, broken up with with intermittent high-intensity efforts. With that in mind, tailored running conditioning should include endurance sessions as well as interval sessions that are completed at high-intensity to replicate the way the game is played. In addition to running sessions, our fitness specialists at The Academy coach our young athletes to engage in X-training to improve fitness without exposing their body to too much wear and tear. That’s especially important when you’re young, to avoid long-term damage to your growing body. Running every day inhibits your body’s ability to recover, so swimming, cycling, boxing and doing circuits is a great way for any young athletes to improve fitness on their “off days”. Strength is needed in Australian Rules Football – something all players need for tackling, jostling for position, running and jumping. This is where a well-designed gym program, addressing hypertrophy, strength and power comes into play to help young athletes build up superior strength, without causing stress on growing bodies. Strong athletes are better able to complete dynamic movements repeatedly, thanks to the decreased relative intensity of these movements, compared to the way their body would handle the movements if they were not strength-trained. To help you understand, imagine if you were to ask a mature, strength-trained athlete to squat 60kgs, ten times in a row, then ask then how hard it was out of ten. Probably, they may give it a four out of ten and tell you that they could repeat that set with a relatively short recovery time. However, if you set the same exercise, with the same weight and reps, to someone who was weak and immature, then they may not even complete the set at all – let alone repeat it. The same idea applies in a game of AFL, where strength is required countless times throughout the full length of the game. As well as helping performance-enhancing capabilities, strength is also important as a way to protect your body from injury. The reason why? Stronger muscles have a higher tolerance to the type of workload and strain that your body experiences when playing AFL. As well as helping performance-enhancing capabilities, strength is also important as a way to protect your body from injury. Mobility is required in Australian Rules Football in many of the movements that are so important to the game. These movements include kicking, tackling and picking up the ball off the ground. Picking up the ball is especially important when you take into consideration the fact that the ball is kicked around 200 times per team in a game, but under half of these kicks are marked – meaning the ball is on the ground most of the time. Mobility is also important for reducing your risk of injury, for example, at those times in the game when tackling athletes need mobility through their shoulders to help absorb the force of the opposing player. Yes, there is definitely a lot more to football that simply keeping score. At The Academy, one of the most important lessons we teach young players keen to improve their game skills is to first improve their fitness. To learn how to play AFL properly at a highly competitive level, you need to train effectively and for that to happen, you need to understand how your body moves, what its strengths are, what its weaknesses are and, importantly, what you can do to protect your body and make it stronger, faster and better equipped to handle the dynamic nature of this very physical sport. One of the most important lessons we teach young players keen to improve their game skills is to first improve their fitness.